This recipe was inspired by our trip to London this past Fall. We ate at a lot of pubs and they all served meat pies. My favorite meat pie was the Steak & Ale Pie. I knew I had to come home and recreate it!! I used some of the leftover Guinness Pot Roast from yesterday for the steak in the pies. It was PERFECT!! I kept this recipe simple. 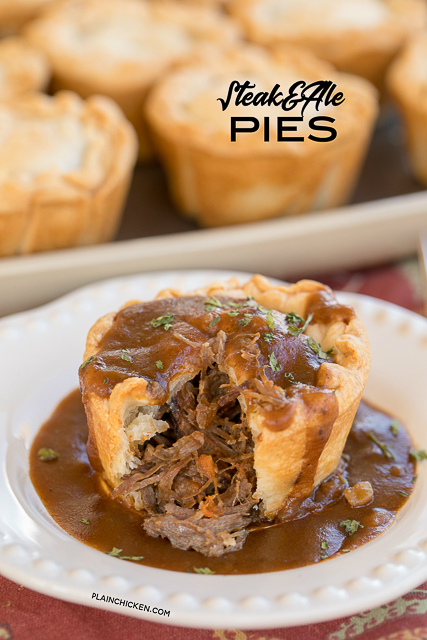 I used two packages of refrigerated pie crust, and these Steak & Ale Pies came together in no time flat! You can make these ahead of time and freeze them for a quick meal later. 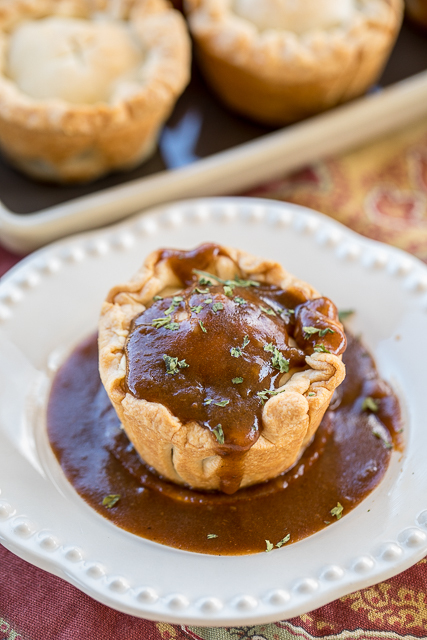 Just whisk up a quick Guinness gravy to go with the reheated pies and you have dinner in a flash. 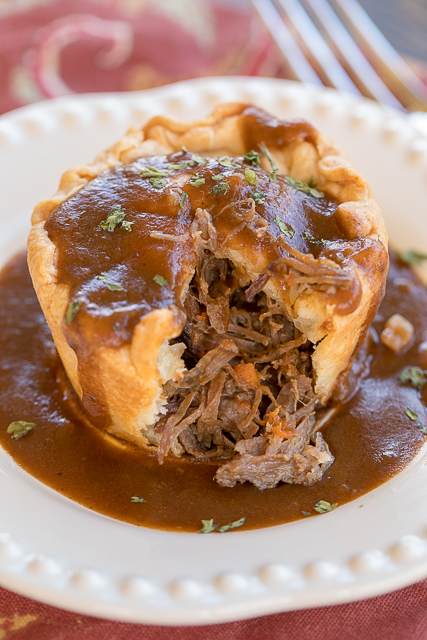 We LOVED these Steak & Ale Pies. They tasted just as good (if not better) than the pies we ate in London. Feel free to add mushrooms and onions to the leftover pot roast filling. Get creative and add your favorite veggies!! Preheat oven to 400ºF. Lightly spray a regular muffin pan with cooking spray and set aside. Unroll pie crust dough. 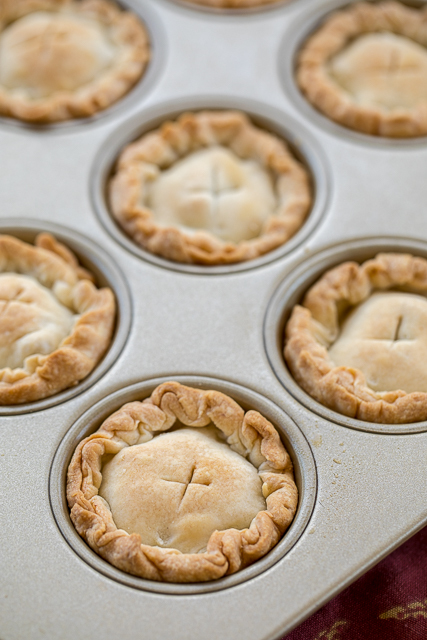 Cut 12 (4-inch) circles and 12 (3-inch) circles out of pie crust dough. You may need to re-roll the pie crust dough scraps. 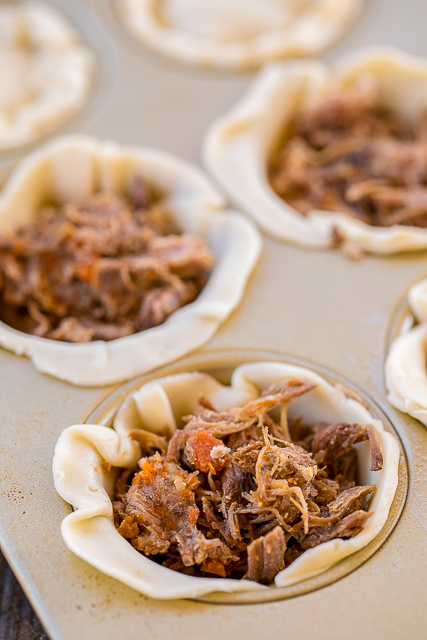 Line muffin tins with larger circles of dough and divide pot roast evenly between cups. Top with 3-inch circles, pinching edges together to seal. Prick holes in top of each pie. Bake for 25 to 30 minutes, until golden brown. While pies are baking, whisk together gravy mix and Guinness in a saucepan over medium-high heat. Bring to a boil and reduce heat to simmer for 1 minute. Pour over baked pies. Hi! I made the pot roast and it was great, i wanna make these pies now and freeze them for the week, since i usually don't get home from work till a bit late. just a quick question- after freezing do you reccomend reheating them from frozen? should they thaw? should i cover them with foil while baking? Thanks!